HONORABLE MENTION: Archbishop Stepinac-CHSFL 7-4, Arlington 6-3, Baldwinsville 6-3, Binghamton 7-3, Boys & Girls-PSAL 7-4, Bronx JFK-PSAL 7-4, Connetquot 8-2, Freeport 6-3, Guilderland 6-3, Hauppauge 6-3, Hilton 5-4, Holy Cross-CHSFL 7-4, John Jay East Fishkill 7-2, Frontier 7-3, Kenmore West 6-3, Liverpool 6-3, Monsignor Farrell-CHSFL 7-4, Newfield,L.I. 6-4, New Dorp-PSAL 8-3, New Rochelle 6-3, New Utrecht-PSAL 7-4, Orchard Park 6-3, Pine Bush 6-3, Pittsford 6-3, Saratoga Springs 7-2, Shenendehowa 6-3, Smithtown West 8-2, Syosset 6-4, Warwick 6-3, Webster Schroeder 6-2. 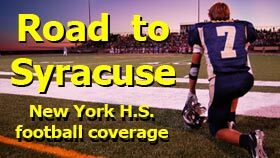 HONORABLE MENTION: Bayside-PSAL 8-3, Bethpage 6-3, Bishop Ford-CHSFL 7-4, Buffalo McKinley 6-2, Buffalo South Park 7-2, Canandaigua 5-3, Cardinal Hayes-CHSFL 8-2, Churchville-Chili 5-3, Eastport-South Manor 7-2, Floral Park 6-4, John Glenn 8-3, William Grady-PSAL 7-4, Greece Athena 5-3, Islip 7-2, Jamesville-DeWitt 6-3 John Jay, Cross River 7-2, Lynbrook 6-3, Massena 7-3, Mount Sinai 7-3, Mount St. Michael 6-5, Nyack 6-3, Ossining 6-3, Petrides-PSAL 7-3, F.D. Roosevelt-PSAL 7-3, Sayville 6-5, Shoreham-Wading River 7-3, Sleepy Hollow 6-3, St. Peter-CHSFL 8-3, Tappan Zee 7-2, Troy 6-3, Vestal 6-4, Wallkill 6-4, Walter Panas 6-2, Wantagh 7-3, West Seneca East 7-2, Yorktown 6-3.